French luxury cruise specialist Ponant has extended its Sealink multi-band communication services contract with Marlink, securing increased internet speeds for guests and vessel operations on their five-strong fleet of high-end luxury yacht/cruise ships, in addition to four planned newbuilds. 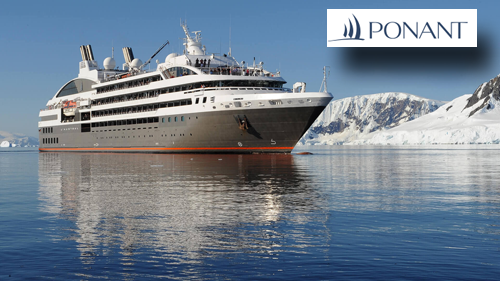 As a result of the new agreement, Marlink’s continuously updated global multi-band infrastructure will deliver even higher Quality of Service (QoS), meeting the increasing demand for fast, reliable and available connectivity driven by Ponant’s unique and global expedition and luxury cruise offering. Combining exceptional itineraries and 5-star hotel services, Ponant specializes in French-style cruises designed to offer excellence across the board, from ship-board services to the quality and exclusivity of the itinerary destinations. The company's five current vessels include: Le Ponant, a three-masted yacht with 32 cabins; L’Austral, Le Boréal and Le Soléal, three luxurious ships with 132 cabins and elegant, understated exterior and interior lines; and the newest, Le Lyrial, with 122 cabins. According to the company, these cruise ships all promise high-end experiences, of which available communication even in tropical regions, the Arctic and Antarctic is a vital ingredient. Marlink is able to deliver even higher QoS to Ponant through the company's global network of overlapping beams on all frequencies. Each vessel will have access to global Ku- and C-band VSAT in addition to L-band solutions and GSM/LTE services, ensuring that the best available service is in use at any time and that IP and voice communication is always available. Marlink’s sophisticated SMARTConnect service will handle switching between alternate carriers to ensure seamless connectivity and class-leading uptime. Jean Emmanuelle SAUVEE, Ponant CEO, noted that as a long term partner, Marlink has been able to ensure coverage on their global network for all Ponant vessels, no matter where they are located, providing connectivity for guests and the firm's business, operational and crew welfare needs. The contract extension introduces even higher speeds and QoS, helping the company to improve on board facilities across the fleet. Tore Morten Olsen, President Maritime, Marlink, added that the luxury and expedition cruise market is a key growth area, driven by high expectations to access the internet and social media platforms, even when visiting remote destinations. Marlink's frequency agnostic, multi-band approach enables the world’s most complete global satellite network, with services over all maritime satellite frequency bands. This is especially appreciated by operators like Ponant in the luxury cruise sector, who naturally have very high demands for global bandwidth, fast connectivity and reliability in order to meet the needs of their guests.